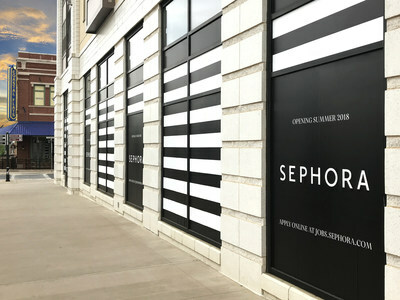 OAK BROOK, Ill., May 17, 2018 /PRNewswire/ -- Retail Properties of America, Inc. (NYSE:RPAI) today announced that Sephora has signed a new lease at Downtown Crown, a 254,900 square foot open-air lifestyle shopping center located in Montgomery County in the Washington, D.C. metropolitan statistical area (MSA). Sephora will join a strong line-up of restaurants and retailers, including Old Town Pour House, Great Gatherings, Harris Teeter, Ted's Bulletin, Coastal Flats, Starbucks, Paladar Latin Kitchen & Rum Bar, and The Woodhouse Day Spa, which is currently under construction and scheduled to open in July of 2018. Sephora is expected to open in the summer of 2018 and will occupy 4,300 square feet of retail space on the corner of Ellington Boulevard and Crown Park Avenue. Sephora is a revolutionary beauty-retail concept founded in France by Dominique Mandonnaud in 1970. Sephora operates approximately 2,300 stores in 33 countries worldwide. "Downtown Crown offers a desirable combination of nationally recognized retailers with unique-to-market dining, shops and services, and the addition of Sephora continues to define Downtown Crown as the regional mixed-use shopping center destination for Montgomery County," stated Greg Goldberg, vice president, leasing director – eastern division. "With the construction of The Woodhouse Day Spa nearing completion and Sephora anticipated to open later this summer, we are excited to expand our beauty lineup to a market that is comprised of young, affluent and educated shoppers who seek the 'live, work, play' environment that Downtown Crown delivers."